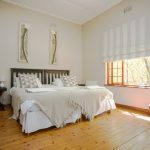 Dirtopia Trail Lodge is situated on the Delvera farm, off the R44 between Stellenbosch and Paarl, and offers comfortable and affordable country accommodation in the heart of the Stellenbosch Winelands. Enjoy the farm atmosphere and beautiful gardens with breath taking views of Table Mountain and the Simonsberg. Browse through Delvera’s pottery shop, wine shop and sample home-made olive medleys. There is also a local craft brewery. visit www.delvera.co.za Please note that these business are only open during the day with various operating hours. For the more adventurous there are pristine walking, hiking and mountain biking trails. Marked routes on Klapmutskop and to the Simonsberg trail network (for mountain bikers). The Trail Centre (open daily from 8am-5pm) rents good Giant mountain bikes. The lodge offers DSTV, a fireplace in the lounge, swimming pool, braai facilities and free wireless internet access. A hearty farm breakfast is served at the Cafe next door from 8am and has kids play areas like go-carts, jungle gym and ball games. The Cafe is open for lunch, but closes 4.30pm. Dinner can be ordered in advance or early continental breakfast in your room. The large five-bedroom farmhouse can be rented per room or as a unit for groups of friends or family get-togethers. It has two standard rooms sharing a separate bathroom and three en-suite rooms as well as a luxury suite separate from the house. The luxury suite is a separate private unit with its own shady patio that has a magnificent view of Table Mountain. This spacious suite has a kitchenette, lounge, DSTV and a lovely bathroom with bath and shower, as well as air-conditioning for those hot summer days and evenings. This room has a private patio with an entrance from the garden. The room shares a separate bathroom (bath and shower) and a separate toilet with Room 2 and is equipped with a fan, television with DSTV and heater. Communal kitchen and living room with rooms 2,3 & 4. This is a spacious room with a garden view. The room shares a separate bathroom (bath and shower) and a separate toilet with Room 1 and is equipped with a fan, television with DSTV and heater. Communal kitchen and living room with rooms 2,3 & 4. This room has a garden view of the swimming pool and an en-suite open-plan bathroom with a shower. The room is equipped with a fan, television with DSTV and heater. Communal kitchen and living room with rooms 2,3 & 4. This room has a private door leading outside to the patio; it has a small en-suite bathroom with a shower. This room is equipped with a big antique cupboard, a fan, television with DSTV and heater. Communal kitchen and living room with rooms 2,3 & 4. This room is separate from the house, thus more private. It has an en-suite bathroom with a shower and is equipped with a fan, a small fridge, a heater and a flat-screen TV with DSTV. This is our luxury room. 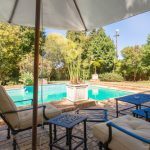 It is separate from the house, has a private patio with a breathtaking view of Table Mountain, a kitchenette, lounge with a sleeper couch, DSTV, air-conditioning, and a luxury en-suite bathroom with a bath and shower. – LATE ARRIVAL: after 17h00 – Please contact us on 082 809 9878 to arrange for a late check in. – There will be a R100 late check in fee after 17h00 and late check-out fee after 10h30. LATE ARRIVAL: after 17h00 – Please contact us on 082 809 9878 to arrange for a late check-in. There will be a R100 late check in fee after 17h00 and R200 after 20h00. After 23h00 R300. Please enquire about early check in fees and late check out fees.